We currently have no rainfall data available for El Paso, TX. Which Grass Types are Best for El Paso, TX Lawns? 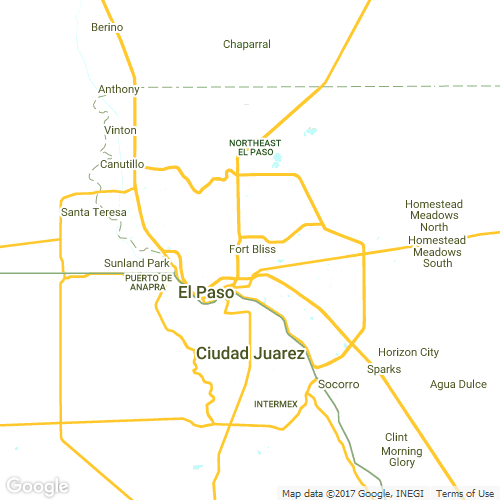 Where are the new residents of El Paso, TX moving from? There are so many ways to experience the eclectic El Paso, and if you’re born and raised here, you no doubt have explored them all. El Paso is in the furthest western corner of the state of Texas, but it is by no means isolated. Situated right on the Rio Grande River, El Paso is a great place to live, work, and play. The city hosts the only medical research and care provider in west Texas, the Medical Center of the Americas, along with the prestigious University of Texas at El Paso. Start your weekend off the right way with breakfast at Kiki’s Restaurant and Bar. This old-school restaurant offers hip, tasty eats, including crab enchiladas and chicken mole. If it’s a Saturday, check out Anthony Street’s bustling artist and farmers’ market for a taste of what the local community has to offer. You might also check out the historic San Jacinto Plaza and take in such fanfare as a splash pad, horseshoe court, the Los Lagartos public art sculpture, or even relax with an ice cold cucumber lemonade. When you’re up for it, there’s nothing like the McKelligon Canyon for a blood-pumping hiking adventure. Alternatively, you can take a drive up the winding Scenic Drive, a great place to view both the sunrise and sunset. Enjoy a classic Sunday picnic at Zin Valle Vineyards or check out the Historic Mission Trail. When you’re done adventuring, you can’t forget to grab some late night grub at Chico’s Tacos, a staple since 1953, or Nachos at the Tap, home to the best nachos in America. Making time for all these activities can be exhausting with your everyday schedules. The only way to do so is by outsourcing your most dread-inducing tasks, of course. Lawnstarter is a one-stop-shop for all things lawn care in El Paso. We take lawn care and garden maintenance off your to-do list, so you have more time to partake in the things you truly enjoy. The process is simple. Just go online to the efficient Lawnstarter website, or even better–use your mobile device to log in to the Lawnstarter app. These accessible services will link you up with a list of customized services, pricing, and potential start dates. You can pick the types of lawn care, prices, and schedules that work best for you and for your budget. We provide everything from tree trimming to flower care to lawn mowing. If you have special requests or unique needs, you can even enter them in when you request service, and we’ll do our best to make sure your every lawn care need is tended to. Call us today or book online to receive a quote. Once you schedule service with Lawnstarter, you’ll never want to touch a lawnmower again–and you’ll spend more time enjoying everything El Paso has to offer. Isaac Garcia is the founder of Global Works, a professional landscaping service in El Paso. Isaac has earned a 4.5 / 5 score from LawnStarter customers. In addition to lawn mowing, Global Works does bush trimming, lawn fertilization, and more. Samuel Baltazar is the founder of Ep Lawn, a experienced lawn mowing service in El Paso, TX. Samuel has earned high marks for reliability, quality, and timeliness. Mdd Lawn & Landscaping LLC, owned by Daniel Soledad, is a family owned lawn care business in El Paso. Customers have rated Daniel 4.6 /5 stars. In addition to lawn care, Mdd Lawn & Landscaping LLC offers shrub care, lawn treatment, and more. Amazing job on a very difficult yard. The lawn looks great! Booking an appointment online was very easy and the price is great. I'd recommend this service. Great job! God bless you abundantly! The edges around the yard could have been cleaned up a little bit more. I know it was is first time on the yard. Thank you for the consistently great job! I love the yard, thank you! He was super friendly. very nice guy. Would recommend him. on time, and did a great job! Abel continues in a meticulous relentless effort with success to make my yard picture pretty. LawnStarter pros will let you know what your lawn needs. Here are some recent recommendations for extra lawn services in El Paso, TX. Description: Back yard Trim down about 1-2 feet for 8-10 shrubs in the back yard along with 2 crape myrtle trees. Description: Full yard Trim hedges in front & rear of house once a month as needed. Description: Full yard Lawn will be Core Plug Aerated with a core aeration plug machine. Items Needing Service: Front hedges. Location on Property: In front of house and to the left of the garage. Work to be Done: Trimmed. Items Needing Service: Leaf removal in back yard. Items Needing Service: Plant to the left of the garage when facing the house. Also, the many dead plants to the right of the door when facing the house. Location on Property: Dead plant to the left of the garage and shrubs to the right of the door in front of the windows when facing the house. Work to be Done: My soil is compact I believe. Should I aerate? Are there watering restrictions in El Paso, TX? The Water Conservation Ordinance, which applies to any person who uses water from the El Paso Water Utilities supply system, contains mandatory year-round restrictions on certain water use activities and prohibits water waste. Does El Paso, TX have long / overgrown grass ordinances? "What does lawn care have to do with home safety?" If you are planning on traveling for an extended time, make sure to have your lawn care service keep up with the maintenance on a regular schedule to ensure that your home doesn't appear vacant to passersby – even if this means paying upfront for service. An overgrown lawn is the first sign that a home is vacant, making it a potential target to burglars. Daniel is the owner-operator of Daniel Valles. Dba, a highly recommended lawn care business in El Paso. He has a 4.5/5 rating. Daniel Valles. Dba provides lawn mowing, small tree trimming, and yard cleanups. Joseph was courteous, friendly, efficient and our lawn looks great! In El Paso, we're one of the top choices for lawn care. Never leaving a mess, we hope to take away your lawn care worries. Your crew arrived on Sun. as I was once again starting to clean up the debris in my yard and pool. It continued to fall and blow down out of the trees. The mowing, edging & weed eating was completed and they cleaned my yard up nicely. Very neat, and you respected most of the requests I made last time. There was some weedeater damage to one of the lemons that hangs very low on the small tree in front of the house, but that would have been difficult to avoid if the person doing the job wasn't the same one as last time - it's difficult to notice unless you're looking for it. Everything else was great! Very nice looking. But the bushes have not been trimmed this time. Do I need to schedule a separate service through the website? Would prefer to have deck blown as Jordan always performed that service. Please put chairs back around fire pit. Lawn looks great.